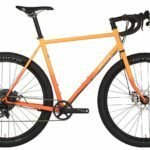 You may have heard of a cyclocross bike, but have you heard of a monstercross bike? Monstercross bikes of the past were the mashing together of mountain bike frames and wheels with road bike cockpits. Riders had to compromise on fit and performance due to the slow steering speed and long front-end of a frame that was ideally intended for flat handlebars. Let’s start with the wheels and tyres. The All City Gorilla Monsoon comes with 27.5 x 2.4” mountain bike tyres that are paired to rims with an inner width of 25mm. These are essentially perfect for a mix of off-road singletrack riding and hardpack dirt roads. If sealed roads are more your thing, the frame will fit 650x47C slicks (and fenders) provided you’re happy with a slightly lower bottom bracket. This will actually result in a more stable ride with a load, due to the lower centre of gravity. The frame can fit 700C wheels with 38-42C tyres too. 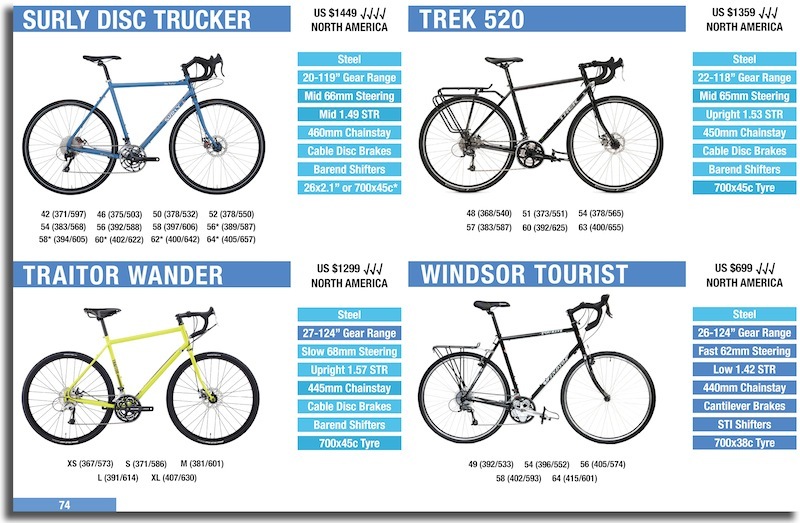 That means you could have two wheelsets on hand for on-road and off-road adventures. Note: 27.5″ and 650B are the same rim diameter, the latter often referring to road bike use. The twin-plate style fork crown is a lovely detail on the Gorilla Monsoon, reminding me of the old Cinelli tandem crowns that now sell used for big $$$ – personally, I love the look! You’ll notice the crown has side eyelets, making it compatible with Surly-8 and 24-Pack racks. This will be ideal for those wanted to fit a front porteur bag or perhaps even a basket. For those who like front panniers, the fork has mid mounts for a lowrider rack. The steering speed of the Gorilla Monsoon is in-line with most modern touring bikes; a tad slower than a cyclocross bike. 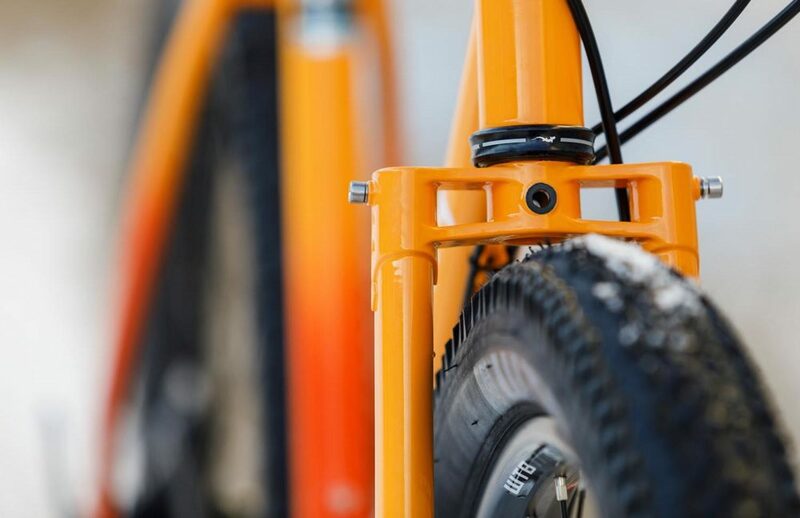 The All City Gorilla Monsoon provides front (15mm) and rear (12mm) thru-axles. These are not typical of most touring bikes but are suited to a modern take on a monstercross rig. The key advantage of thru-axles is that the wheel always slots in straight, allowing the disc rotors to align perfectly with the calipers. 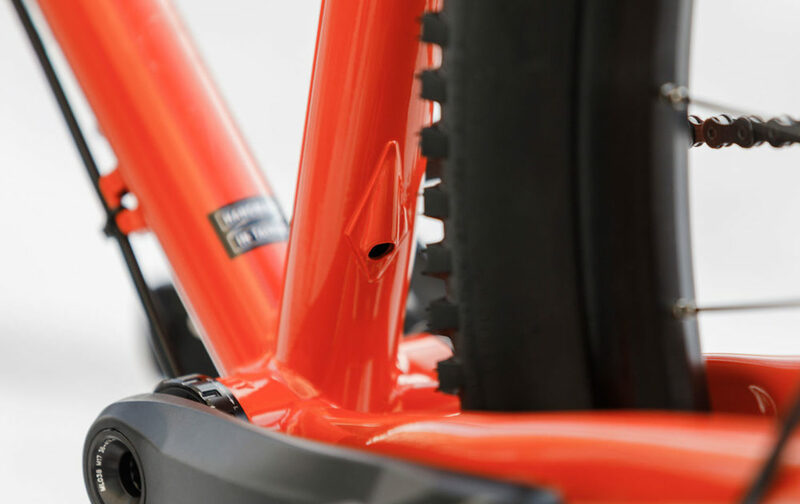 You’ll notice what seems to be an odd hole in the seat tube. This is to fit a cable connecting from the handlebars to the seatpost. Dropper posts allow you to adjust the seat height on the fly. I feel this is only really necessary on steep off-road trails, but dropper posts are gaining in popularity for gravel riding too because they help lower your centre of gravity and achieve a more aerodynamic position on fast descents. The stock bike comes with a SRAM 1×11 drivetrain and a 11-42t cassette. 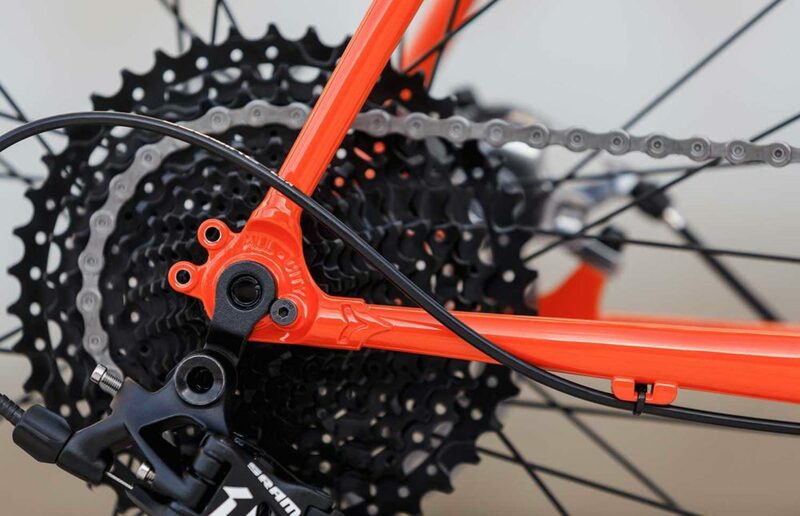 With the 36T front chainring, the gear range is 24-92″. This is a bit short in the low gears for both loaded touring and most off-road singletrack, but does tend to suit a light load on almost any gravel road. 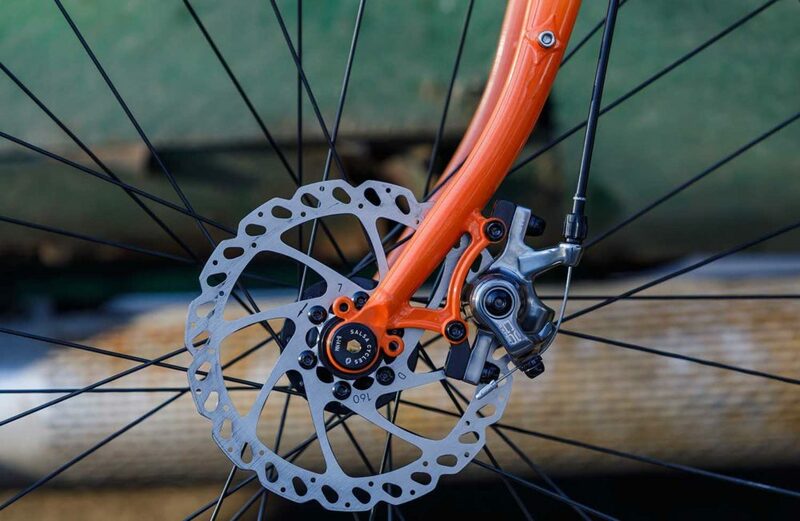 For lower gears, you could change the front chainring, or alternatively, fit a front derailleur. The wider-than-usual 73mm threaded bottom bracket shell makes fitting MTB front derailleurs and MTB cranksets (eg. 48/36/26t or 42/28t) very easy. The Gorilla Monsoon is available in seven sizes that get proportionately larger to suit riders from 150cm to 200cm. It works out to be quite tall in the front end which aligns with most touring geometries. 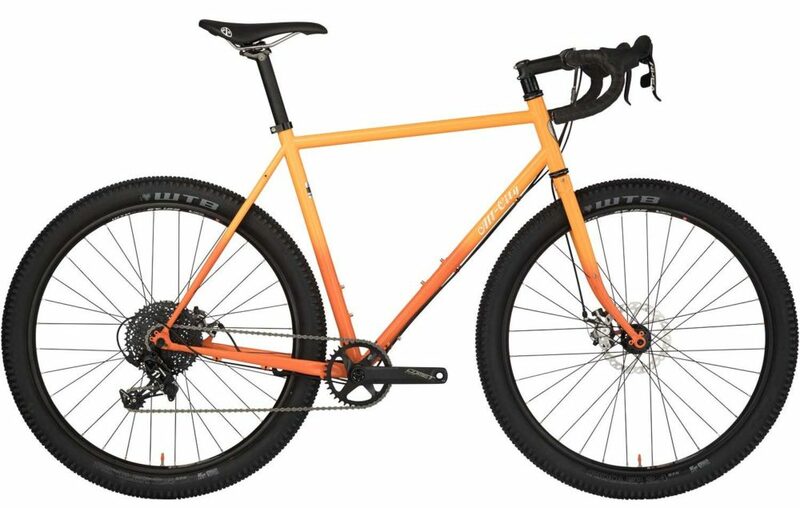 While not designed specifically for touring, the All City Gorilla Monsoon will suit a lighter, more minimal setup. Whether that’s bikepacking bags, two large panniers, a porteur bag or a combination setup – the frame design lends itself to self-supported adventures. 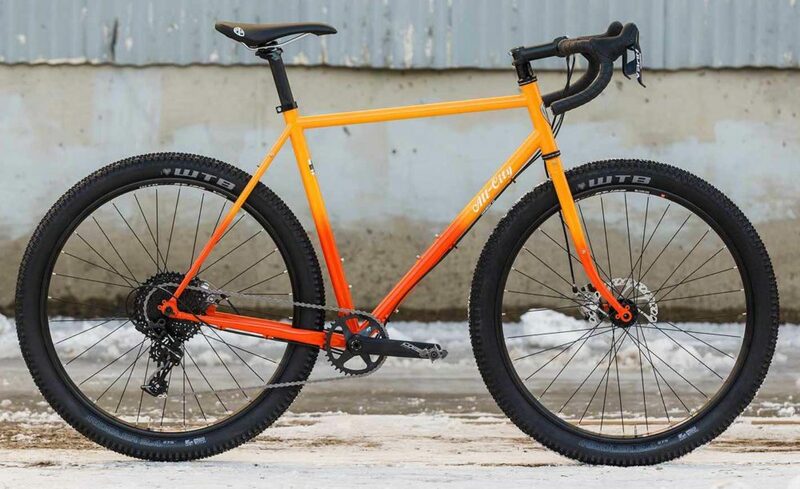 With the SRAM Apex 1×11 gear system, Hayes cable disc brakes, sealed bearing hubs, WTB rims/tyres and Salsa Cowchipper handlebars – the complete bike retails for US $1999. 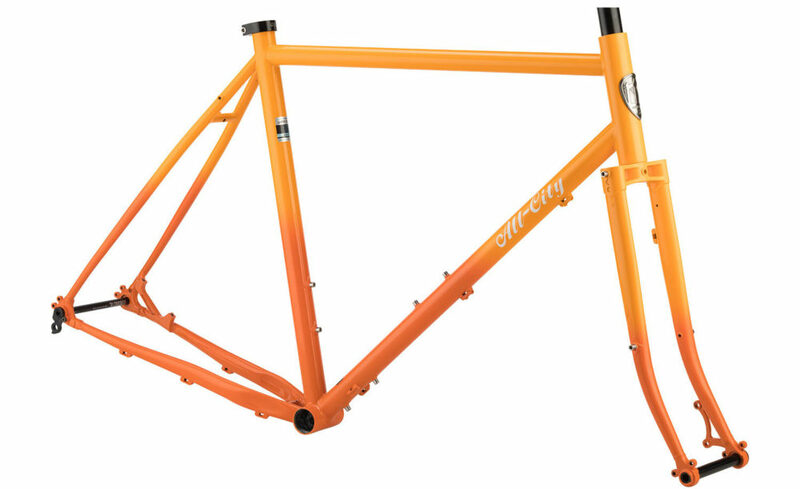 Alternatively, you can also order the frameset alone for US $850 should you prefer a custom build.